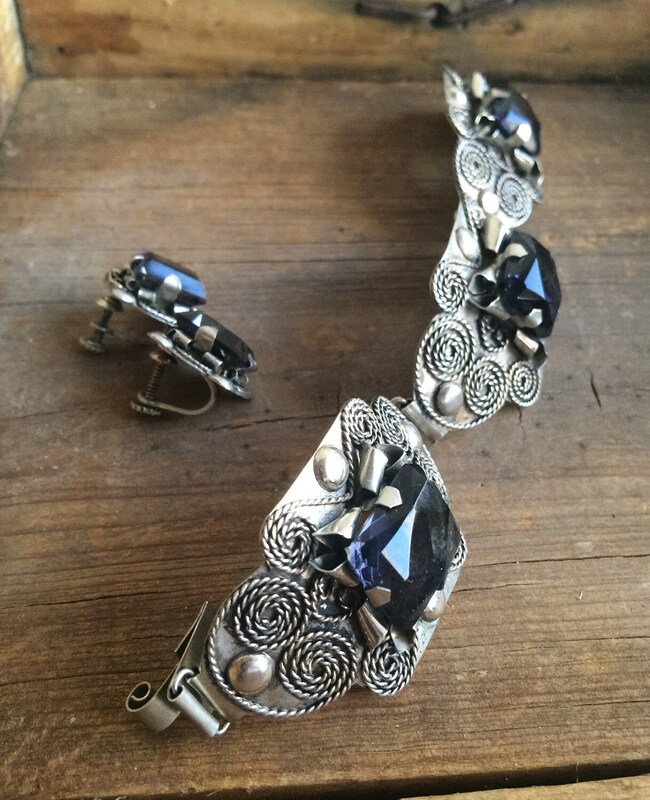 For those collecting post-revolutionary Taxco jewelry, this bracelet-and-earring set is a treat. As you know, jewelry made in this part of Mexico experienced a renaissance after the Mexican revolution, from 1931 til the 60s, largely due to American silversmith William Spratling, who settled in Mexico and revitalized this long-standing art form. In fact, the demand for Taxco style jewelry was so strong during this period that it became a staple at large department stores in the U.S. From Collector's Weekly: "For those who could not make the trip to Taxco, U.S. stores took the step of importing these popular goods. At one point everyone from fashionable Gump’s in San Francisco to Montgomery Ward in Chicago carried silver jewelry (some decorated with obsidian or amethysts) and tableware by Taxco designers." What we have here is an example of that Taxco craze--in the form of Taxco style costume jewelry. 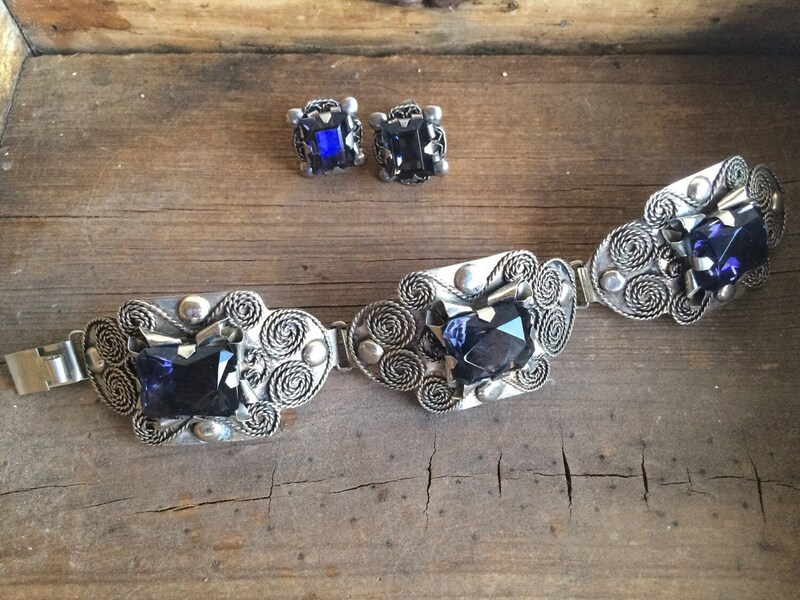 Not the kind set in 925 sterling silver but rather what in those days was a more affordable version, set in nickel and every bit as dramatic and appealing as sterling silver Taxco pieces. Bracelet measures about 3/4" wide and just over 6-1/2" long not including the snap-in clasp. On the back, there is a barely readable round HECHO EN MEXICO stamp. 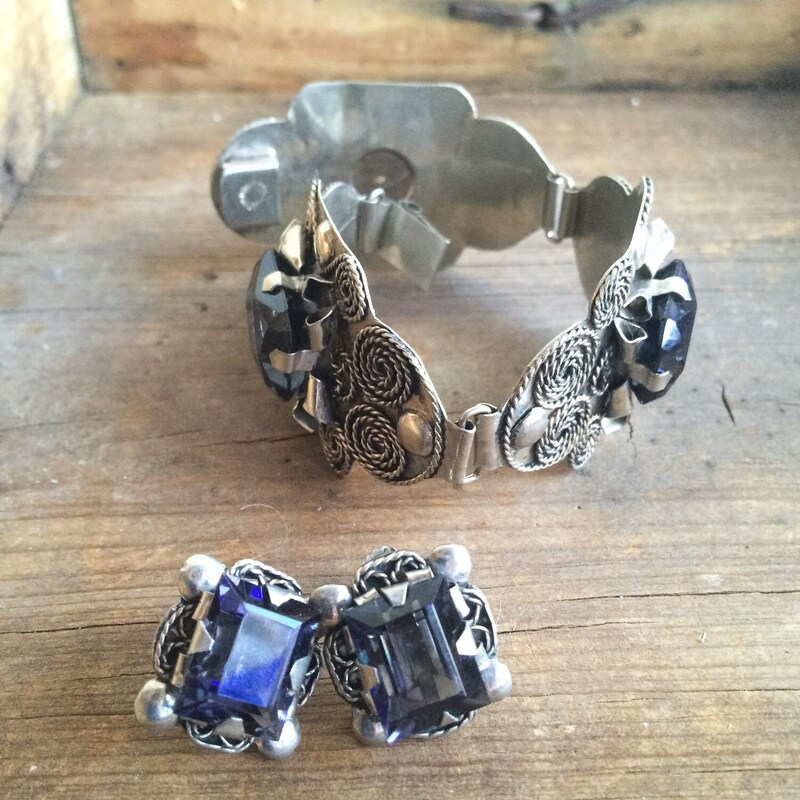 Five faceted gray-aquamarine glass "stones" (three in bracelet, one each in the earrings) are set in high-quality, hand-crafted nickel plates. In some lights they are a stormy gray-blue, in other light much more violet. Beautiful, beautiful! Each bracelet stone measures approximately 3/4" by 5/8". 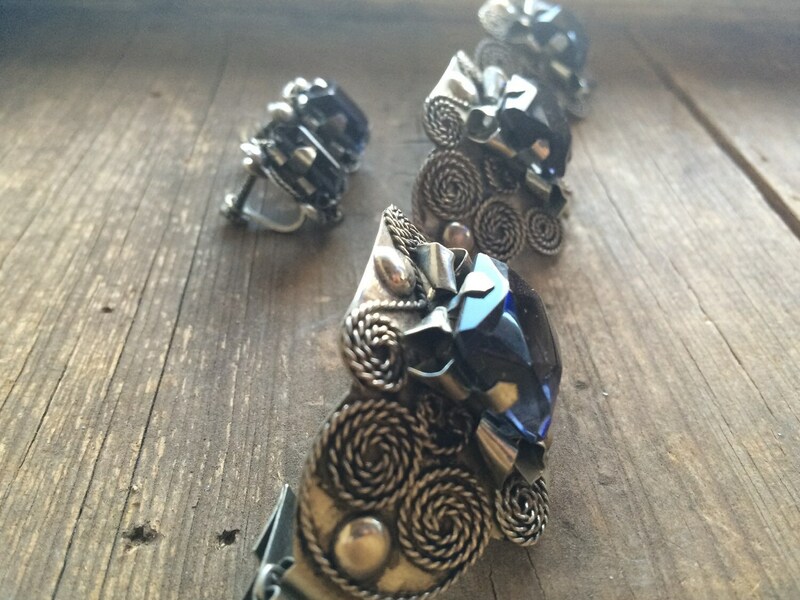 The curved nickel plates on which each bracelet is attached is about 2-3/4" wide by 1-1/4" tall. Elaborate filigree scrolling all around the setting lends an elegant feel. The bracelet has a light feel and tingling sound characteristic of nickel. The faceted stones of the earrings measure about 1/2" by 3/8". The same scroll design on the bracelet, albeit on a smaller scale, is repeated. Each earring measures just under 3/4" wide by just over 3/4" tall. The earrings are screw-back. The pieces are in excellent vintage shape. 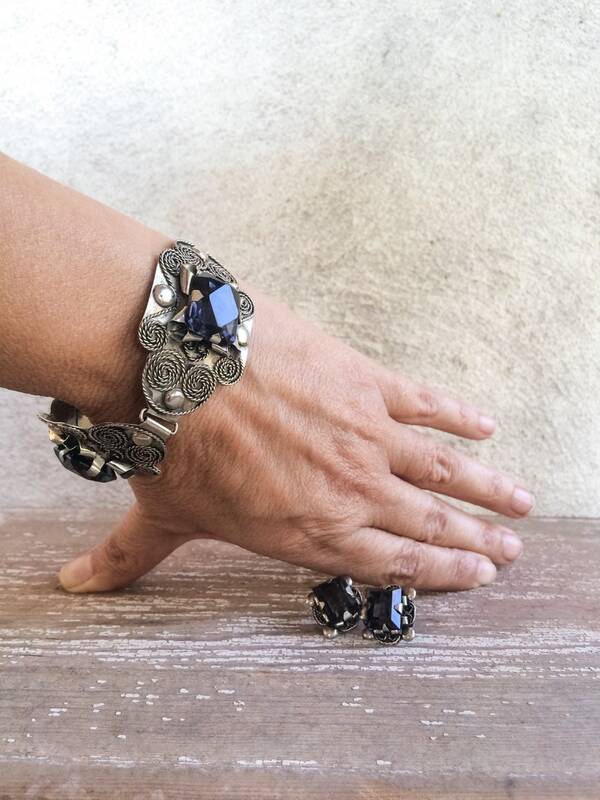 It is truly an elegant, distinctive jewelry set reminiscent of a Spanish Colonial past.